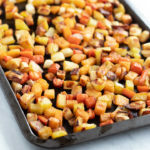 Low FODMAP Roasted Root Veggies recipe – slow-roasted potatoes, carrots, parsnips, and rutabaga make for a scrumptious side dish. Preheat oven to 375°F. Toss vegetable pieces with olive oil in a large bowl. Place on a baking sheet in an even layer. Season with salt and pepper. Bake for 45 minutes. Stir and bake for another 45 minutes, checking every 15 minutes, until fork-tender and just starting to brown. Serve warm or store in the refrigerator for up to 4 days. Rutabaga: Per Monash University, a low FODMAP serving for rutabaga is 1 cup, diced or 75 grams.